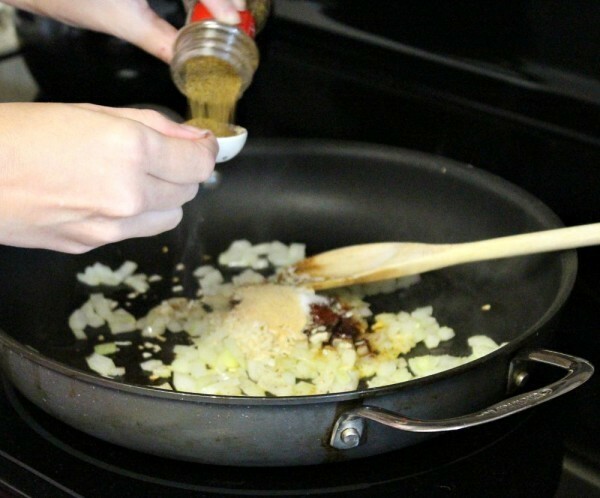 I’m back with another easy weeknight meal idea! If you ask me what I want for dinner or where I want to go for dinner, 9 times out of 10 I’ll say Mexican. I have a deep love for Mexican food that can not be explained through words. Believe me, I’ve tried. One of my all-time favorite meals as a child was my mom’s Mexican Casserole. Between its cheesy goodness and corn tortillas, it satisfied my picky palate. Sometimes she made it with chicken and sometimes beef. 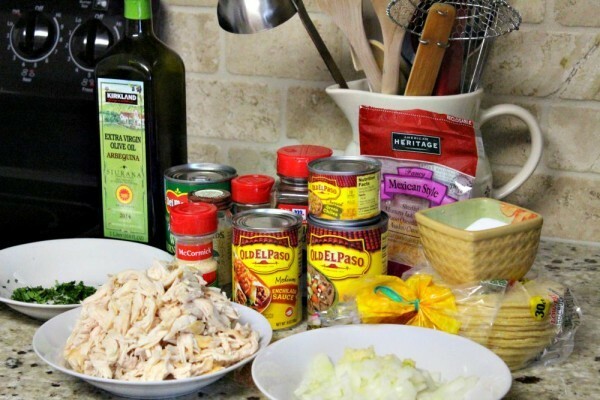 I wanted to re-create this recipe without using that processed cheese product I love so dearly in queso, and here’s what I came up with….something not even really close. Hah! As I was writing down the recipe trying to come up with ideas, I kept adding ingredients until I had something I could not wait to make. In the end, it’s really not a recreation of one of my childhood meals, but something new altogether. And spoiler alert – it’s SO good. 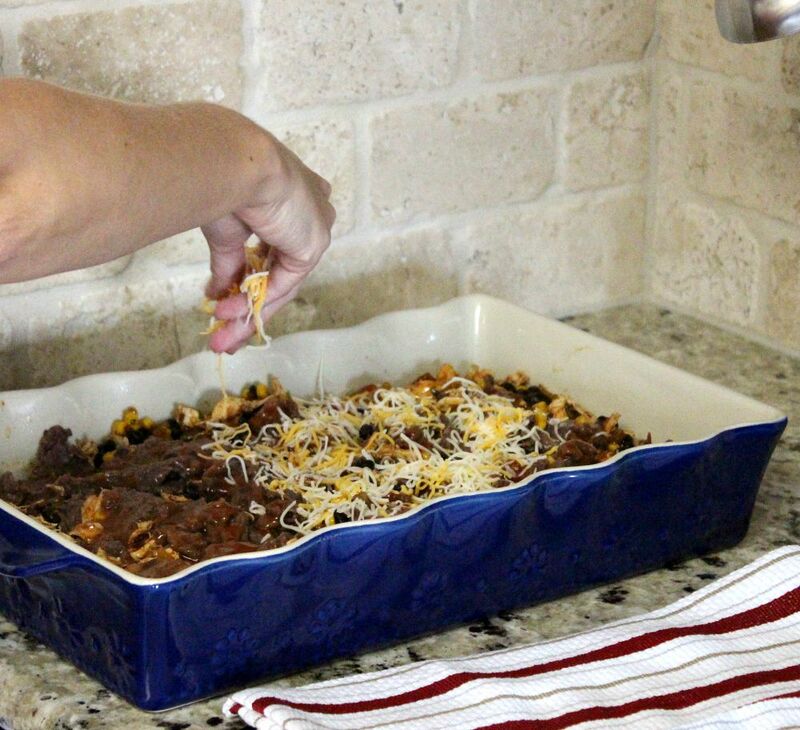 I headed into my local Randall’s store to pick up all of the ingredients for this Easy Mexican Chicken Casserole. 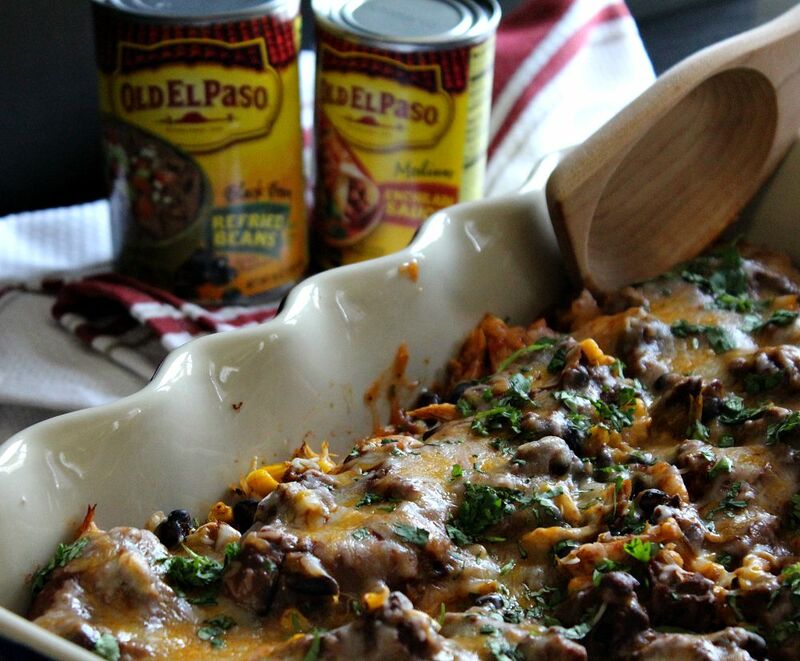 I’m a loyal fan of Old El Paso products and have been using their refried beans, red enchilada sauce and green chilies in my recipes for years. All three of these are in this recipe. It’s a true flavor explosion. When you purchase your Old El Paso products, don’t forget to clip the Box Tops found on the packaging and on other General Mills products, to earn 10 cents each for your school through the Box Tops for Education program. It’s a simple way to earn money your child’s school could really use! There are two reasons why this dish is an easy weeknight meal solution: one, there is little chopping and involves mostly opening cans, which means it’s fast to prepare and two, it taste even better leftover – so make it ahead of time and just pop it in the oven for 15 minutes right before dinner. Easy peasy! 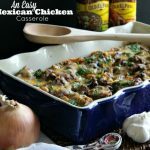 This Mexican Chicken Casserole is easy to assemble, fast to prepare and contains so many flavors it’s sure to please your family. 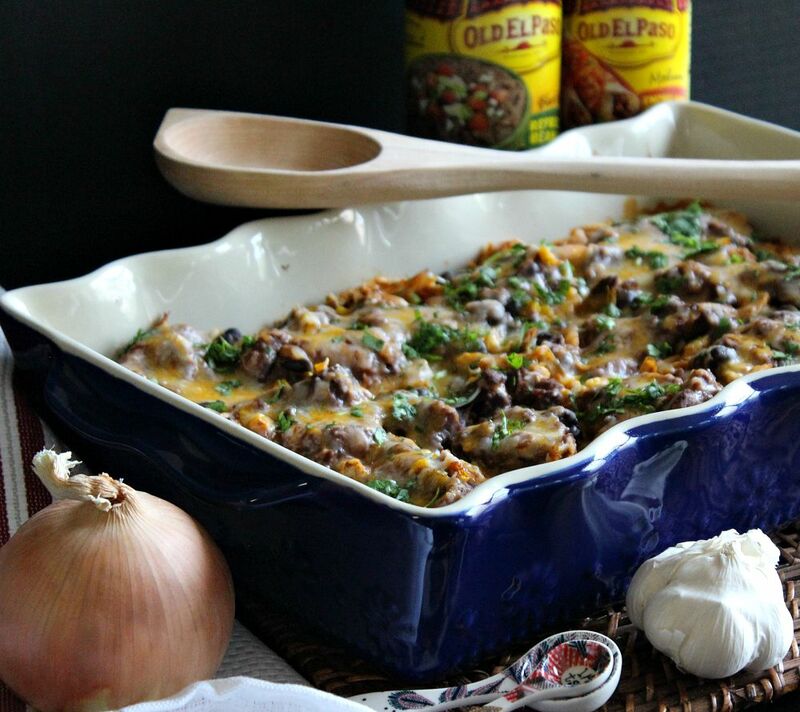 It goes from oven to table in a little over 30 minutes, which makes it perfect for a weeknight meal. Gather your ingredients. 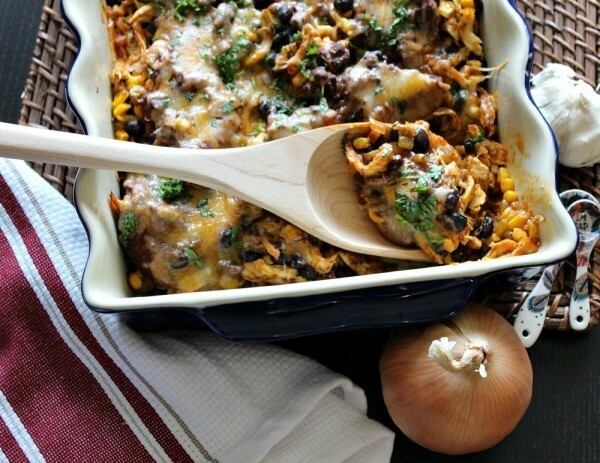 I always have shredded chicken ready and waiting in the refrigerator for recipes like this. Just make a big batch on Sunday, shred it up and use it throughout the week. That’s one tip that helps make this recipe ready in 30 minutes. 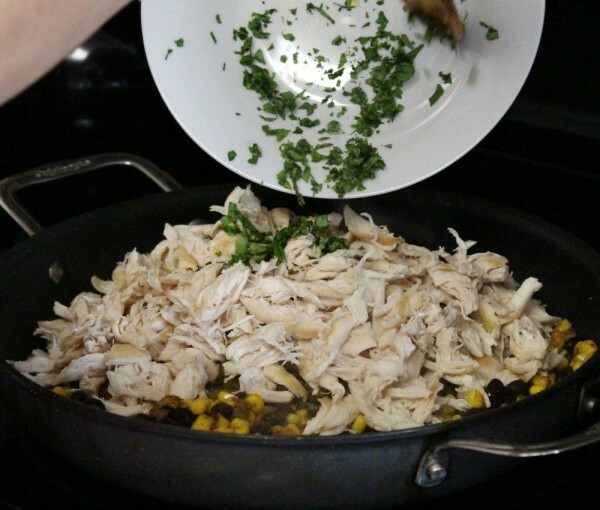 No one wants to spend 30 minutes (or more) on a weeknight cooking and shredding chicken! Heat the olive oil and add the onion and garlic. Cook 1 to 2 minutes until fragrant and onions are opaque. Stir in seasonings, black beans, corn and green chilies. Cook until heated through. Stir in chicken and cilantro and heat through. Set aside. 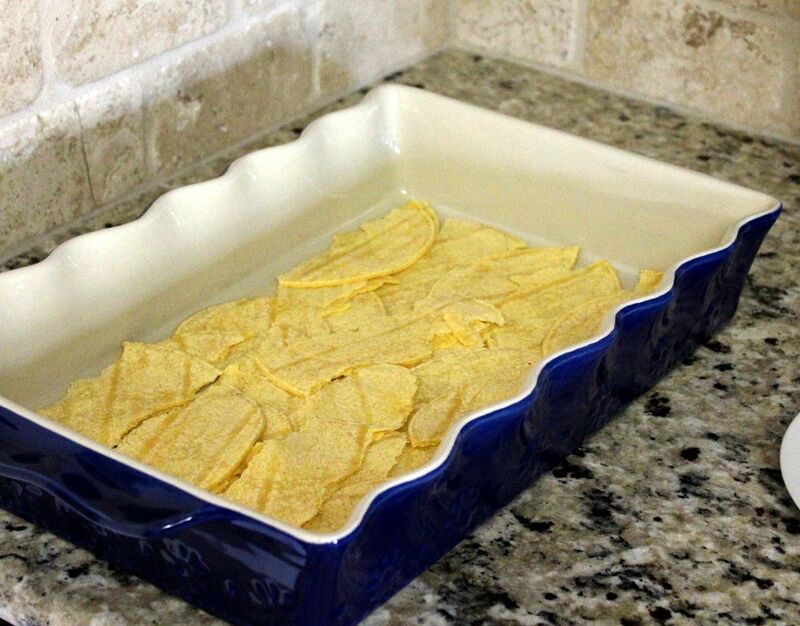 Grease 9×13 inch pan and lay shredded corn tortillas on the bottom of the pan. Tear the corn tortillas into 3 pieces. Use about 8 to10, or whatever your preference of thickness is. 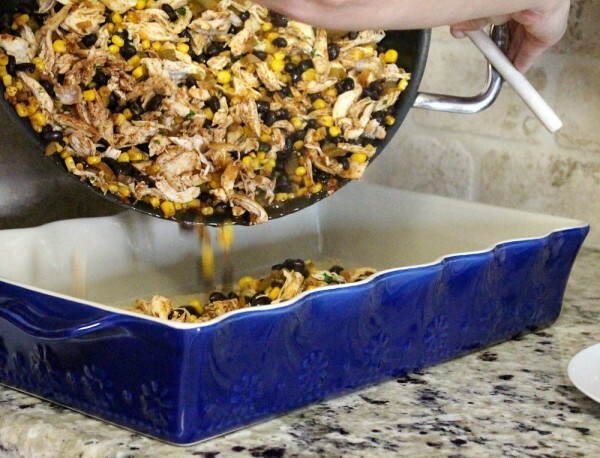 Spread the chicken mixture on top of the corn tortillas. Drop dollops of the refried beans on top of the chicken mixture. The mixture should still be warm, so let the beans sit on top for a minute. They will warm and be easier to spread. Spread the refried beans out as best as you can. Pour the can of enchilada sauce over the chicken and refried beans. Top with shredded cheese. Bake in a 375 degree oven for 15 minutes. The cheese should be melted and the mixture bubbly. Garnish with cilantro. This Mexican Chicken Casserole dish is easy to make and makes Mexican food lovers rejoice. 2. Heat the olive oil in a large skillet over medium high heat. 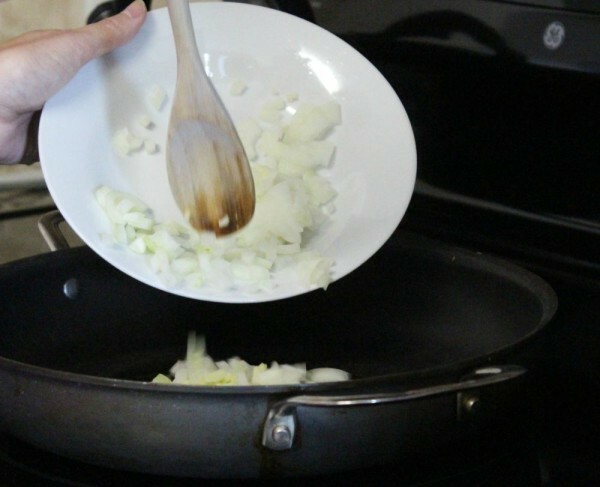 Add onions and garlic and cook until fragrant and onion is opaque. About 2 minutes. 3. Add the chili powder, salt, onion flakes, garlic powder and cumin. Next add the black beans, corn and can of green chilies. Stir and heat through. 4. Stir in the shredded chicken and cilantro. Heat through. Set aside. 5. 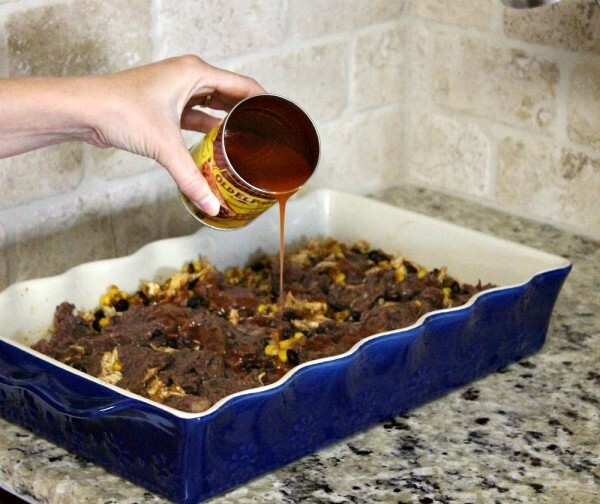 Grease a 9x12 casserole pan. Layer the shredded corn tortillas on the bottom of the pan. 6. Pour the chicken mixture on top of the corn tortillas and spread out evenly. 7. 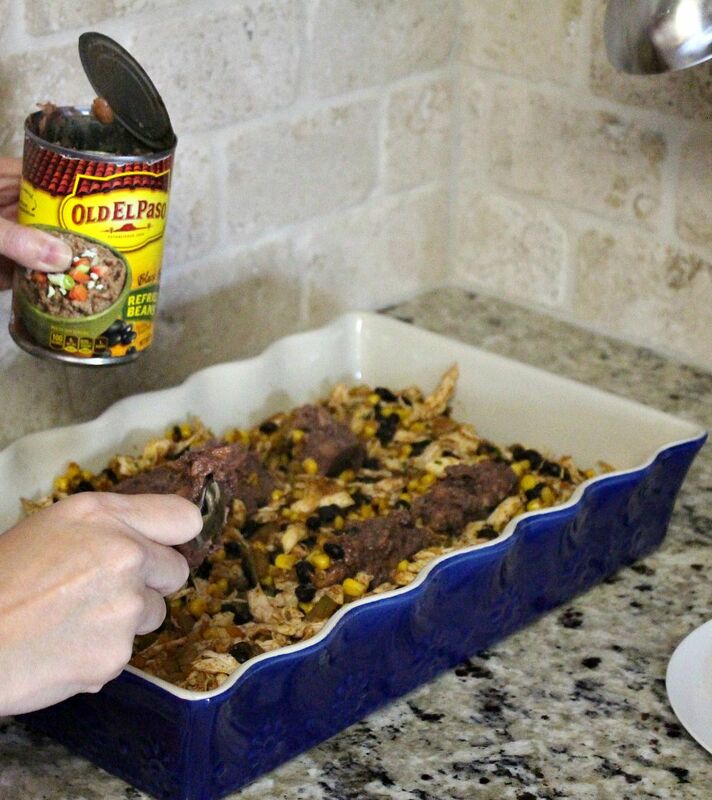 Using the entire can of refried beans, dollop the beans over the chicken mixture. The chicken should still be warm, so wait a minute or two for the beans to warm. This will make it easier to spread them out. Spread the refried beans as best you can. 8. 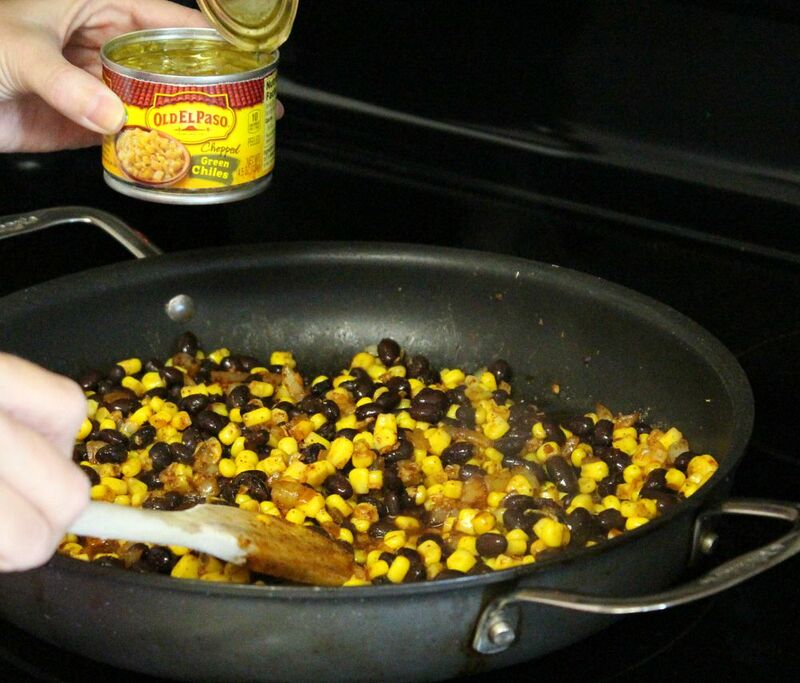 Pour the entire can of enchilada sauce evenly over the beans and chicken mixture. 9. Top with the shredded cheese. 10. 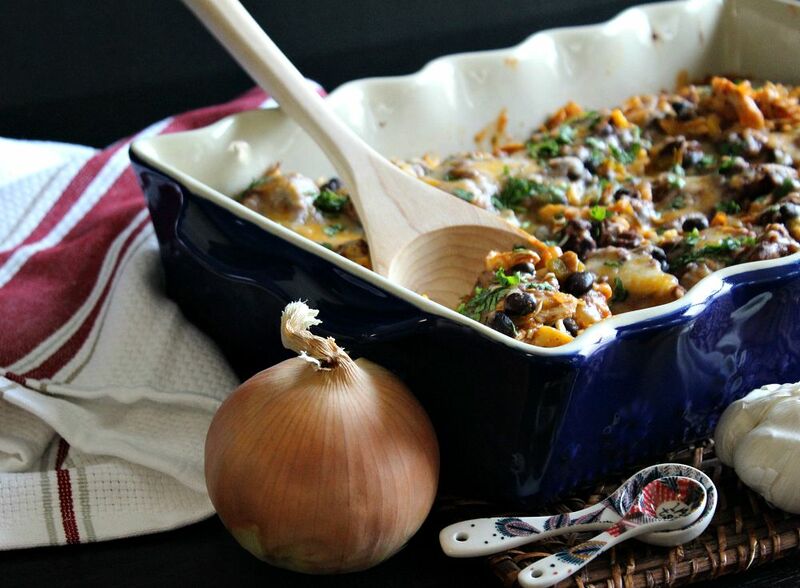 Bake for 15 minutes, until cheese is melted and dish is bubbling.